It's Challenge #186 and will run starting today through January 31st at midnight EDST. We always allow an anything goes theme for all our challenges. We also proudly welcome three new Design Team Members, Beth, Diane, and Snoopy. What's more masculine than game day!!! A brilliant card Sue, such a fabulous image, another new one to me and lovely bright colours - a perfect masculine card. Fantastic job on this guy card although it would also be great for my DIL. I think she like football more than most guys I know. Anyway this is a great coloring job. I love the color on the can, it truly looks like a an aluminum can. Have a fun week. Well my dear Sue...this is TRULY a "masculine" card!!! What can I say...you've blown me away!! So true that this image (and your card) couldn't get any more male!!! The PERFECT take on Pauline's theme!!! FLAWLESSLY done!! Thank you for the warm welcome to your Mousey Team...I'm SO excited to be crafting with all of you!! A fabulous card Sue - a perfect design and image for a Male card. Beautiful colour scheme and details!! Hi Sue wow what a fab stamp very Masculine..lots going on in this scene..love the vibrant colour combo fab take on the masculine chall theme. Love your take on todays masculine challenge, Sue...fab colour combo and a great layout. This is fabulous Sue, I love the image, a brilliant layout and wonderful colours. A wonderful masculine card! They're always the hardest for me to create, so thanks so much for the inspiration. 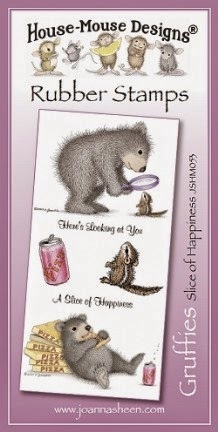 Love your easel card and the image is so cute!